I thought it was a fun style and wanted to try the renderer on a stylized character. 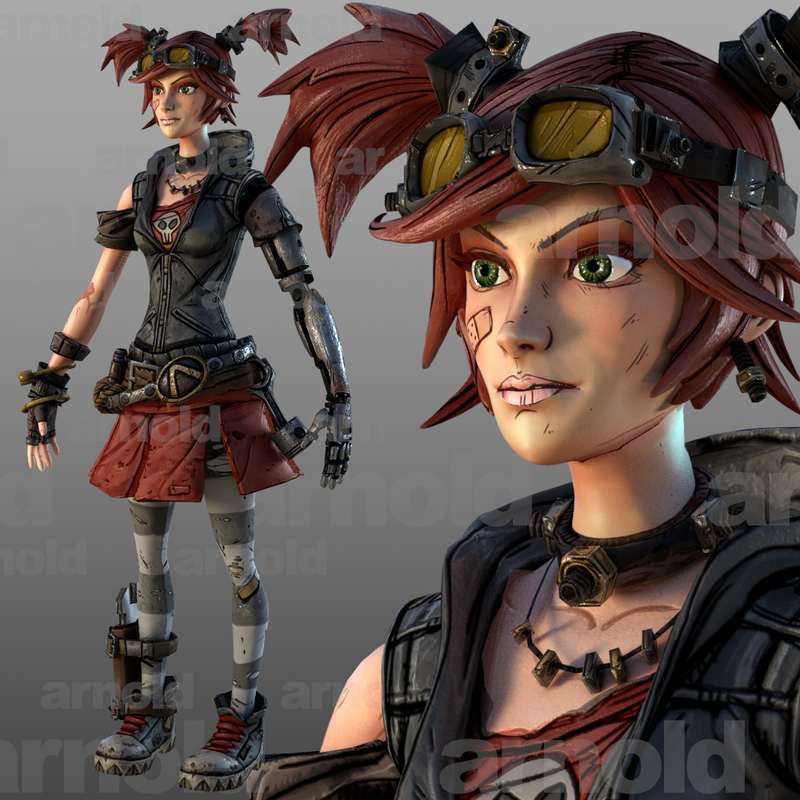 I feel she has a nice blend of stylized features, yet the shaders feel more realistic. It almost feels like a clay maquette. Overall I'm happy with how this rendered. In total, I probably spent 3-4 hours on the development. I started with the model and a single color texture. From the color texture, I created a bump, spec, gloss, and 3 SSS maps. I played with both the SSS shaders and the standard Arnold shader. The standard Arnold shader work similarly to the MIA or VRay shader, however there are some differences in reflection terminology, as Arnold calls everything "Spec" and has a simple reflection formula that it calls "Reflection". For most purposes, spec is what you want to play with. I also wished the frenel effect was controlled with IOR, as it's currently a single slider that determines reflectivity at the normal and blends to the tangent. (Note, this feature was added soon after I rendered this image). I did have some issues where I wanted to use a matte to blend between 2 materials, as currently they don't have any sort of layered shader to do this. For this model, I actually cut out faces in areas like the chest where I had a skin shader mixed with her shirt on the same mesh. After bringing it up in their email forum, I was told that the Maya layered shader renders correctly, even with AOV's. I've also been told there are others that have compiled free shaders for this. Render times were again, very fast. She was lit with 2 area lights and a HDR. Render time for a 1920x1080 vertical render was under 2 minutes. Full GI, raytraced SSS, and even an additional ambient occlusion AOV. So far, I'm really liking Arnold even more than I thought I would. I feel VRay has a broader range of tools and may be a better overall rendering solution, but Arnold is right there in the front line, and definitely pulls ahead in some areas. *EDIT* This character is a video game character, however I have added subdivision and displacement on parts of the mesh, so while it was a low resolution base, the render is rendering a higher res mesh.